The Sungold Sawara Cypress is a great gift tree for the busy or new gardener. It rolls up it sleeves and gets to work, bringing solid yellow and gold color to the garden and making a lovely mound of pendulous thread-like foliage without asking for anything in return. With a round and mounded shape, a little wider than it is tall, this plant always looks neat and trim and never needs attention to stay that way. Not only that, this beauty is hardy to minus 40, so for someone who lives in the coldest areas it is a great choice. Typically it reaches about 3 feet tall, although it may eventually grow taller, and 4 – 5 feet tall, so it really fills a space in a corner, at the top of a wall, along a driveway or beside a door. It will never become bare at the bottom or untidy at the top, but it will always look great, no matter the weather or the season. 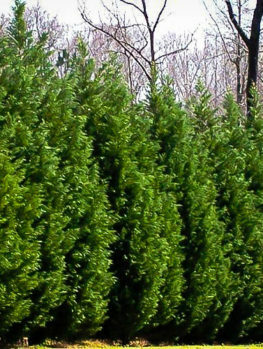 This evergreen is the perfect choice for any gardener, especially those who would rather enjoy their garden than work in it. Choose a sunny location for the Sungold Sawara Cypress, to develop the best yellow and gold colors, but almost any soil will suit it just fine, as long as it is not constantly dry. New gardeners often need plants to put around the house as foundation planting, and this is an ideal choice, filling a good space and never growing too tall and blocking windows. It also does really well in planter boxes and even large pots, where it is a no-maintenance option to costly and time-consuming annual flowers. The ideal gift tree should be interesting, different, and cheerful, yet also need little care, be adaptable to different soils and conditions, and also be problem-free. 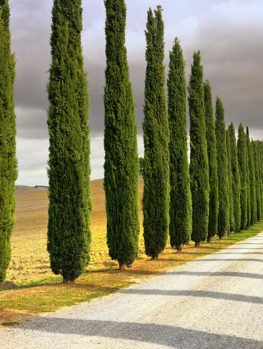 That can be a tall order, but with the Sungold Sawara Cypress it’s in the bag and on its way. 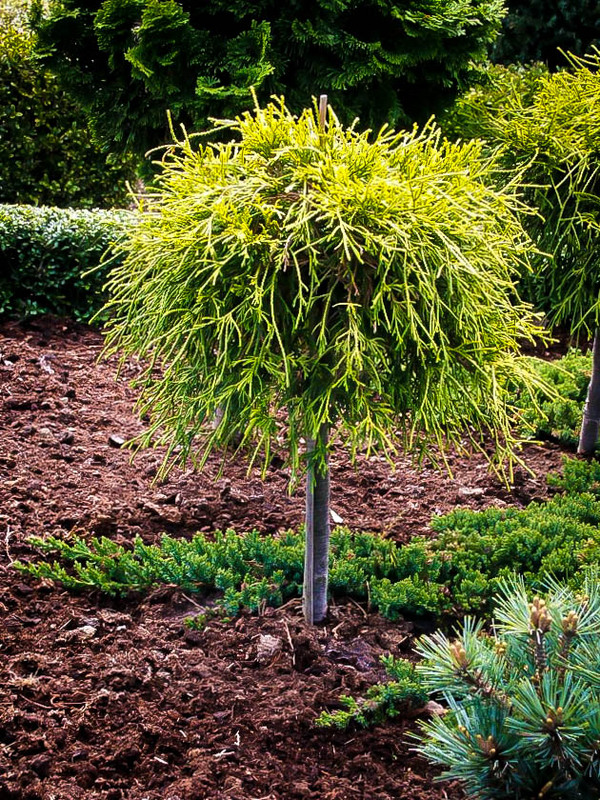 This beautiful evergreen forms a compact mound that is perfect for foreground planting in any location, from around the house to out in garden beds, or among rocks and walls too. 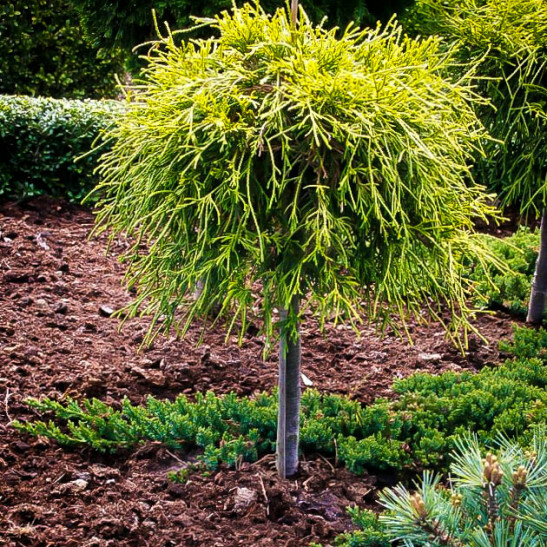 With its thin, cord-like foliage in showy shades of yellow, gold and bronze, this is a high impact plant with low impact on time and trouble. 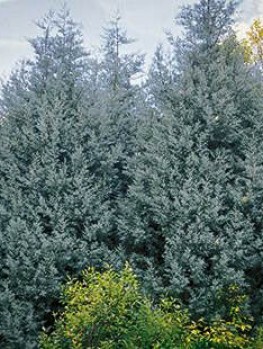 Over time this bush will grow slowly, and may eventually reach 8 feet in height and over 10 feet wide, but if that is too large, a simple shearing will not only keep it within almost any size-range, but encourage lots of new growth awash with bright color. If you gift this bush to someone starting a new garden, it will become a center-piece and always a favorite for everyone. 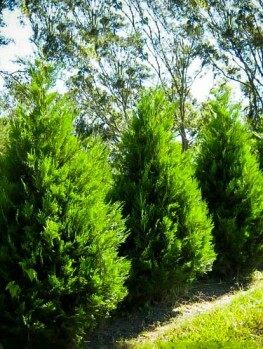 All the Sungold Sawara Cypress asks is for its rightful place in the sun, otherwise the color will be more yellow-green, but if that is available it is not fussy about what type of soil it is planted in, although a fertile and moist soil will suit it best. Once established, plants will shrug-off normal summer dryness with no problem. This is a plant that will grow best in colder areas. It is hardy to minus 40 and finds the South or California a little too hot. This is fine, because northern gardeners are exactly the people who have more limited choices. 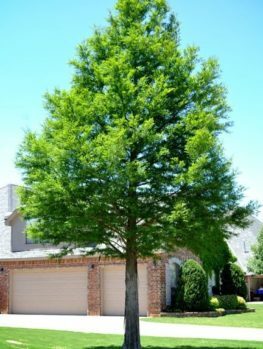 So no matter how cold it gets where the person you are thinking of giving this tree to, no problem, the Sungold Sawara Cypress can handle it without difficulty and will thrive on the cooler, damper springs and summer too. Part of what give this plant its special qualities is the foliage. The branches are long and thread-like, as well as being arching and pendulous. So the profile of this plant is soft and rounded. As it grows the stems arch above each other and spread outwards, so it is always wider than it is round, and always an attractive mounded shape that needs no trimming to keep it looking neat and tidy. The real plus though is the color, which is a great yellow to gold shade over all the plant. The new growth is the most strongly colored and later in the year it will turn more lime-green, especially if not in full sun. This means you see more change through the seasons and variety is added to even the simplest planting. In winter the foliage may turn an interesting bronze color, but unlike other similar plants, it will not burn or brown – this is a tough plant! Because of its pendulous habit, even old plants still have foliage right to the ground, so this a great space-filling plant in any situation. It looks terrific planted at the top of a wall, where it will even begin to hang-down a little, and a pair will frame a door or an entrance beautifully. This is also a very useful plant for planter boxes and much less work than annual plants. It will always be colorful in a planter, and will remain compact for many years, needing nothing besides water and the occasional drink of liquid evergreen fertilizer. The natural form of this tree, the Sawara Cypress, is a large tree native to Japan, where it will grow 100 to 150 feet tall in the forests. 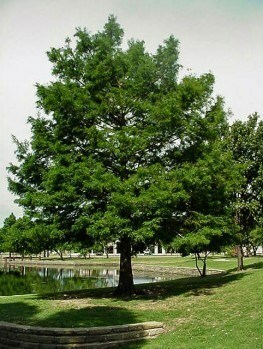 The wild tree is rarely cultivated outside of perhaps some parks or very large gardens. The wild tree looks quite a bit like the Lawson Cypress, an American native tree found in northern California and Oregon. Many forms of the Sawara cypress have been collected, including a number with thread-like foliage, which is a feature of the Sungold Sawara Cypress. There have been other forms with golden foliage before, but they all suffered from a tendency to ‘winter burn’, a condition where the cold causes the ends of the branches to die. But Sungold does not do that, which is another reason why it has become popular since it was first discovered in 1969 at the Grootendorst Nursery in the Netherlands. So for the perfect gift tree, look no further. The Sungold Sawara Cypress has it all. 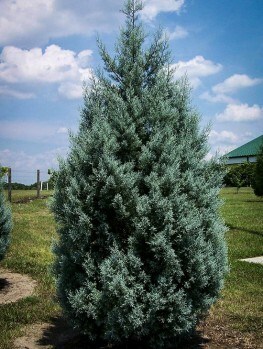 Winter hardy, brightly colored, always neat and trim, trouble-free and needing no special attention, this tree is the perfect gift for the new or busy gardener, who will see immediately that you have considered their needs and chosen accordingly. Because this is such a popular tree, demand is high, so order now and don’t disappoint that special someone. 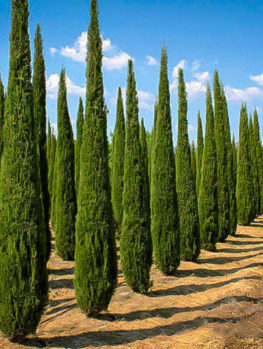 You may also want to consider some of our other popular gift trees, including the Italian Cypress and the Arizona Cypress.